What lawyers don't tell you. The realities of record keeping. What lawyers don’t tell you. The realities of record keeping. Why do Substitute Decision Makers (POAs) have to keep records? What does it mean to keep records? Why does a Substitute Decision Maker (POA) care about how accurate their records are? Who might a Substitute Decision Maker (POA) have to show their record keeping to? Linda is a Chartered Accountant who has worked in Australia, England, Hong Kong and of course, Canada in a variety of accounting roles. The past few years have provided opportunities to become more involved with estate management, where the lack of proper record keeping has led to litigation as siblings take their siblings to court over the financial management of their parent’s affairs. Her response to this kind of work was to write a book providing information and tools to help people manage the task of looking after someone else’s money to help them stay out of litigation court. 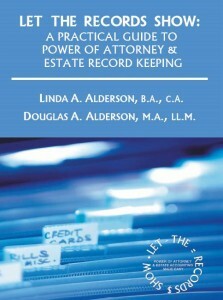 It also addresses the issues that we should all be aware of when choosing our attorney for property and estate executor. Most recently, Linda has been engaged by a number of organizations to provide information to their membership on how to best protect themselves from financial elder abuse. Let the Records Show offers a ten-step guide for effectively handling record-keeping obligations, and it demystifies and simplifies the terminology and related work processes associated with creating a complete and proper information trail to satisfy legal interests.